Bracing for patients with knee osteoarthritis (OA) has been a popular topic in the medical literature lately, with four review articles epublished in the latter half of 2014.1-4 And, although research continues to suggest that knee OA bracing can lead to improvements in pain and function, questions remain as to the best way to ensure compliance with brace wear and whether or how bracing affects disease progression. “I don’t think that practitioners should deter patients from trying braces based on the risk of complication alone,” said Rebecca F. Moyer, MPT, PhD, a physiotherapist in the Faculty of Health Sciences and at the Fowler Kennedy Sport Medicine Clinic at the University of Western Ontario in London, Ontario, Canada. In the meta-analysis, Moyer and colleagues found that bracing is associated with small to moderate improvements in pain and function in patients with medial knee OA, with varying effect sizes depending on trial design and the type of control devices compared with braces. The meta-analysis covered six randomized trials involving 445 patients, 274 of whom used a valgus knee brace. Photo courtesy of medi USA. Overall, bracing was associated with a small but statistically significant improvement in pain and function. Five of the studies compared an OA brace group to a control group that used a control orthosis (neutral knee brace, neoprene knee sleeve, or shoe insert); when those five studies were analyzed as a group, a small difference favoring OA bracing remained with respect to pain, but not function. All six trials reported details regarding the instructions practitioners gave patients for brace wear, but those instructions varied greatly; some advised patients to wear the brace all day, while others recommended wearing it only during activity, as needed, or a minimum of four hours a day. Three studies reported on brace-related complications, which were minor and included constraining fit, slipping, swelling, blisters, and skin irritation. In another recent systematic review and meta-analysis published online in late November 2014, Moyer and colleagues concluded that valgus knee braces alter knee joint biomechanics during walking, with moderate to high effect sizes, and involve a combination of mechanisms.2 The analysis included 30 studies and 478 patients. The potential mechanism that was most often supported by the review findings involved the application of a valgus moment to oppose the external knee adduction moment. Another potential mechanism involves increasing knee joint stability, which decreases muscle co-contraction. 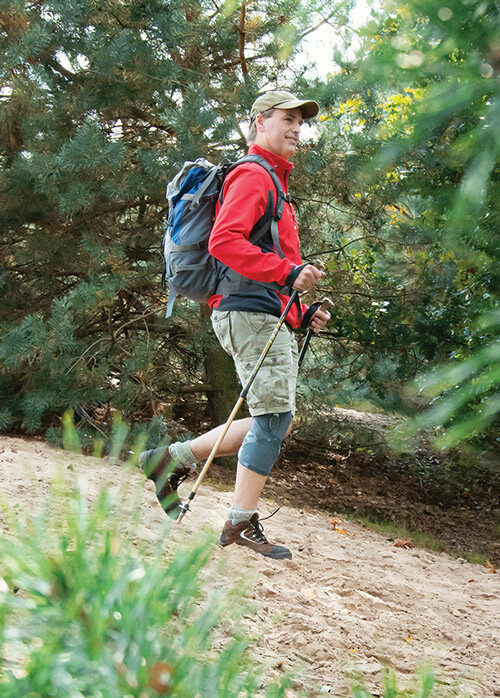 Two other 2014 reviews, one from the University of Social Welfare and Rehabilitation Sciences in Tehran, Iran,3 and another from the Steadman Philippon Research Institute in Vail, CO,4 similarly concluded that knee OA bracing was associated with improvements in symptoms and gait parameters but did not appear to affect disease progression. The findings are tempered, Moyer and colleagues warned, by substantial uncertainty regarding clinical benefit and by consistent reports of poor compliance in the medical literature.5-8 Although two of the biomechanical studies included in the review found that greater valgus angulations in the brace are associated with greater reductions in the external knee adduction moment,6,9 the meta-analysis did not find a significant association between brace angulation and treatment effect. Moyer and colleagues suggested this could be due to poorer patient compliance associated with discomfort at greater angulations. The most recent review “is a very good overview of the state of knowledge on what we know about the changes in the biomechanics with bracing,” said Cheryl Hubley-Kozey, PhD, professor in the School of Physiotherapy and School of Biomedical Engineering at Dalhousie University in Halifax, Nova Scotia, Canada. Hubley-Kozey lamented, however, the lack of original studies on bracing and OA progression outcomes, with most researchers citing a 2002 study linking baseline peak knee adduction moment to radiographic OA progression,10 and using the peak as the indirect link to progression. Neil A. Segal, MD, professor and faculty physiatrist and director of clinical research in rehabilitative medicine at Kansas University Medical Center in Kansas City, agreed that studies of braces and disease progression should be a priority. The studies that show more of an effect of bracing, Segal said, are ones that involve dynamic aspects, including those analyzed in the second review by Moyer and colleagues. “It’s the dynamic effect of the brace—if anything does affect disease status, it would be that. We’ve known for several years that abnormal alignment of the knee as well as loading of the joint increases risk for worsening of disease and physical function,” he said. Most OA bracing studies have focused on the knee adduction moment, Hubley-Kozey noted. Her group is now using a comprehensive 3D motion analysis and electromyographic assessment to investigate other potential contributing factors, such as 3D kinematics, loading patterns, and muscle activation patterns, to understand the effectiveness of bracing. Some of the variability seen among studies may be due to the severity spectrum, Hubley-Kozey added, because some studies focus on people with less severe OA while other studies focus on moderate or more severe disease. Another thing that contributes to variability in findings is the design of the braces themselves, Segal said. Photo courtesy of Össur Americas. “The systematic reviews have shown small symptomatic effects to moderate dynamic biomechanical effects. But there are so many different types of braces, and the braces that are in the studies may not be the types that are used more popularly, because there is poorer compliance than with some of the braces that have been studied. They’re more rigid and they’re bulkier, and people just find them uncomfortable and, unfortunately, don’t want to wear them frequently,” he said. Studies and real life don’t necessarily coincide, Segal said. Compliance and dose are also key issues, researchers said. “We also need to figure out ways to design effective braces with which patients will be compliant. If patients don’t take the therapy, it doesn’t matter if it works or not, it’s not going to work if the brace sits in a closet,” Segal said. Although Hubley-Kozey’s group reported in 2012 that higher OA brace wear dose was positively associated with physical activity level and did not result in muscle impairment,11 it’s also possible that too much dosing leads to lower compliance. “If someone is sitting at their desk, do they really need to be wearing [a brace] for x hours a day?” she said. Segal concurred with the assumption in the second Moyer review—that the longer braces are used and the more correction provided, the lower the compliance. In a study that has not been published yet, Hubley-Kozey and colleagues instructed patients to use braces as needed for six months. “We saw a wide range of ways in which people would use it, but most didn’t change over the six months. They stayed at their particular level of wear,” she said. Still, she said, the studies that have been done are important and ultimately provide the valuable groundwork for designing trials that will focus on disease progression. “Those trials are very expensive, and you have to make sure you have a solid foundation on which to base your hypotheses,” Hubley-Kozey said. Doing more to ensure that correct brace fit is maintained over time could go a long way toward improving compliance, according to Eric Lamberg, EdD, PT, CPed, an associate professor in the Department of Physical Therapy at Stony Brook University in New York. In a study that was presented as a poster in September at the most recent annual meeting of the American Orthotic and Prosthetic Association (AOPA),12 Lamberg and colleagues assessed the effects of a decompressive knee brace in 17 adults with unilateral knee OA over a period of eight weeks. Knee extensor and flexor muscle function was assessed at baseline and again after two and eight weeks of brace wear. Use of the brace was associated with improvement in average peak torque and average power for both the flexors and extensors after two weeks, and improvement continued after eight weeks, though the affected limb remained weaker than the unaffected limb. But detailed instructions, proper fitting, and follow-up are key, Lamberg added. Bracing “should be thought of as a treatment when applied properly—and I think that’s the key word, properly,” he said. About half of the patients in his study needed a reminder about how to fit the brace after having worn it for two weeks, he said. Overall, Moyer told LER, what everything comes down to is matching individual patients with the best treatment. Unfortunately, however, while doing their systematic reviews Moyer and colleagues found there are only limited data available about bracing outcomes for specific patient subgroups. Stricter recruitment criteria for trials may help, Moyer suggested. “Rather than just recruiting anybody who has knee OA, let’s try these devices in somebody who has knee OA and some other characteristic,” she said. In the meantime, practitioners will continue to rely on their own clinical expertise to find the right match between brace and patient. “Do you need a very rigid lateral support for somebody that has instability? If your patient is not presenting with instability, then do you necessarily need those rigid lateral supports, or can you attain that unloading effect via other mechanisms of a brace? That’s where an orthotist is going to have a much larger role in matching patients with the ideal brace and then determining optimal dosage for that brace, whether that’s angulation or just frequency of use,” Moyer said. Moyer RF, Birmingham TB, Bryant DM, et al. Biomechanical effects of valgus knee bracing: a systematic review and meta-analysis. Osteoarthritis Cartilage 2015;23(2):178-188. Barnes CL, Cawley PW, Hederman B. Effect of CounterForce brace on symptomatic relief in a group of patients with symptomatic unicompartmental osteoarthritis: a prospective 2-year investigation. Am J Orthop 2002;31(7):396-401. Fantini Pagani CH, Hinrichs M, Bruggemann GP. Kinetic and kinematic changes with the use of valgus knee brace and lateral wedge insoles in patients with medial knee osteoarthritis. J Orthop Res 2011;30(7):1125-1132. Giori NJ. Load-shifting brace treatment for osteoarthritis of the knee: A minimum 2 ½-year follow-up study. J Rehabil Res Dev 2004;41(2):187-194. Squyer E, Stamper DL, Hamilton DT, et al. 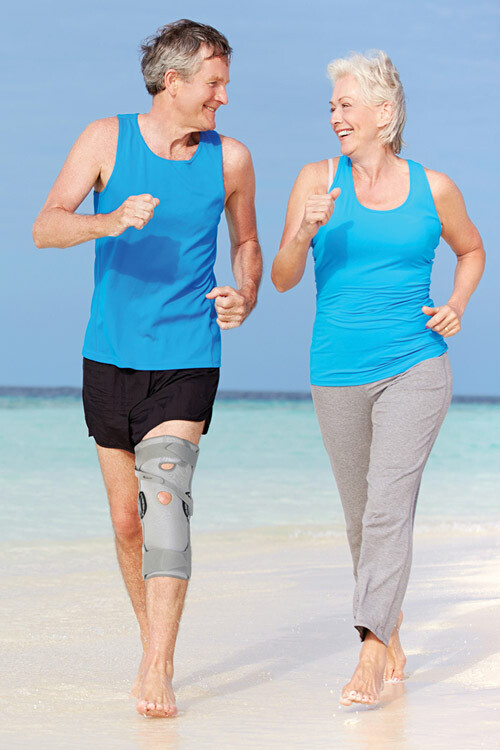 Unloader knee braces for osteoarthritis: do patients actually wear them? Clin Orthop Relat Res 2013;471(6):1982-1991. Kutzner I, Kuther S, Heinlein B, et al. The effect of valgus braces on medial compartment load of the knee joint – in vivo load measurements in three subjects. J Biomech 2011;44(7):1354-1360. Miyazaki T, Wada M, Kawahara H, et al. Dynamic load at baseline can predict radiographic disease progression in medial compartment knee osteoarthritis. 2002;61(7):617-622. Streb R, Werner M, Kremenic IJ, et al. 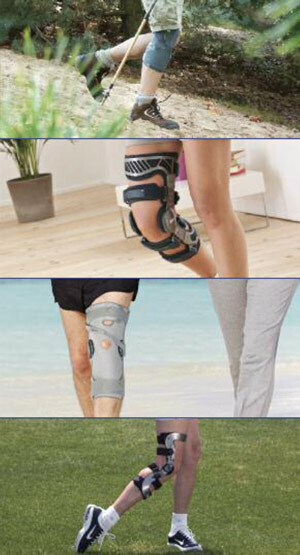 Muscle function improves with decompressive knee bracing for osteoarthritis. Presented at the American Orthotic and Prosthetic Association National Assembly, Las Vegas, NV, September 2014.